Nashik is considered quite a religious city in Maharashtra and it has a strong history, unique culture and rich heritage. Thus the cities surrounding the area also emit the religious effect. If you're looking for a day's trip from Nashik, then Shirdi is the closest place, known for its deep religious roots and also as the city of "Sai Baba". Shirdi is a holy town situated in Rahata Tehasil, Ahmednagar District in the state of Maharashtra. The town is under the jurisdiction of Shirdi Nagar Panchayat (Municipal Council). It is located at a distance of approx. 88 Kilometres from the main city of Nashik. Why you should visit Shirdi? The city attracts numerous devotees from different countries of the world. Devotees visit here to offer prayers at the Samadhi Temple. Shri Sai Baba is worshiped in the temple. Apart from this temple, there are many places of tourist interest where one can spend some cheerful moments. The temple is the main attraction in the town of Shirdi. It is one of the important places of worship for Sai Baba's devotees. History says it was constructed by a rich man who was worshiper of Lord Krishna. The place is related with the life of Sai Baba and it is the same place where he took his last breath. Scores of devotees visit here every day and start queuing up in the early morning to offer prayers to Sai Baba, wishing a blissful life. 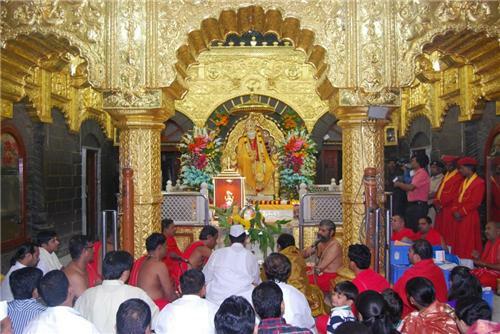 Every Thursday, a grand puja and darshan are offered to the idol of Sai Baba. Other places of tourist interest in the city are Dwarkamani Mosque, Shani Mandir, Changdev Maharaj Samadhi, Kandoba Temple, Gurusthan Temple, Sakori Ashram, Lendibagh, Dixit Wada Museum and Chavadi. The place is well connected by Air, Rail and Road. The nearest airport is Aurangabad and closest railway station is Shirdi. The bus service is easily available from Nashik. Travellers can also hire a AC or non-AC taxis depending upon their budget. One day trip to Shirdi from Nashik is a tour that would give you an exceptional experience in lifetime. This is the perfect journey for those tourists who have a short period of travel time. we want to join a group tour of one day tour of Nashik important places.we are 3 persons. This is on December 26th. Pls. Reply with program and price.